Ink Colors: 14 standard colors to choose from (See color bar at top). Background Pantographs: Select from 51 different background options. Border Options: Select from 58 border options. Parts: Up to 3 parts available (white, canary, pink). Packaging: To fit your printer requirements (Ascending or Descending numbering). Business Laser checks and laser business forms with more colors to choose from. 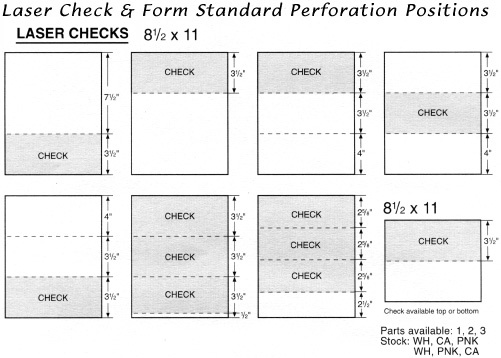 The Form One Standard Plus program for laser checks and laser forms lets you determine your own unique style. First, YOU select a favorite background. Second, YOU choose a border style. Third, YOU can select up to two ink colors for your company information and accent colors. If it means modifying a standard laser check or laser form layout or creating a special format from scratch, we have the flexibility to create exactly what you need. The laser checks are produced on 25# check stock with additional security features. One of which is Toner-Grip that infused the ink into the paper when printed in a laser printer. 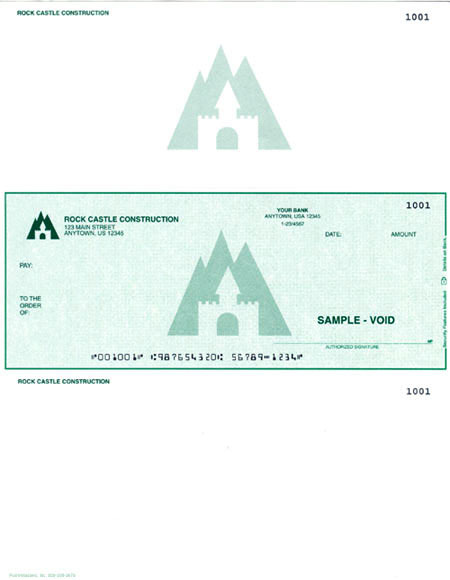 Laser Checks and Laser Forms are available by clicking the link below. There you will find 100's of laser forms and checks for all your business forms requirements. Look under the Laser Checks and Forms - Form OneSP Option for more detail information for laser checks and laser forms where you can print in one or two ink colors of your choice. We have laser checks and laser business forms available in up to 3 parts (white, canary, pink). Call us if you need help with your order.